The Economy is Not Working for the Majority – Anticipate! You can download this posting by clicking HERE. As you may know, I sit on the Mayor of Edmonton’s Task Force to End Poverty. Because of that honour I am privy to a range of research and data, not to mention the bright minds of the hundreds of people now involved with this effort. What follows are some of the data I pulled from a recent report done for the task force by the Edmonton Social Planning Council (ESPC), as well as some additional data I am adding to the mix. That said, the following commentary is mine and is not meant to represent the Task Force or anyone else on it. I have written numerous times about the rise of the economically vulnerable in our communities and about the need for a better way to understand economic growth. Analysis about our economy tends to focus on indicators that have, at best, questionable relevance to a large proportion of our population. In other words, I suspect that those who are most vocal about the robustness of our economy are actually a minority of people who benefit the most from the economy. Albertans have the highest median income of all the provinces. Income for all census families in 2012 was about $99,000. Edmonton is up there too near the top of Canadians cities. Lone parent families have a median income around $47,000, and single people come in at $29,000. 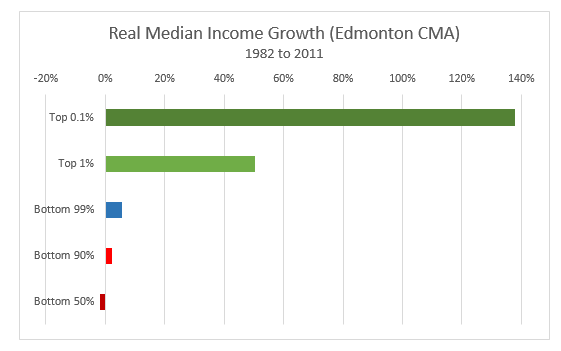 Despite being nation leaders in median income, looking at an median rates of income doesn’t really tell the biggest part of the Edmonton’s economic story. Just over 12% of Edmontonians (100,870 people) live with low income. Two parent families make up 44,200 of this number; 30,600 are single parent families, and just over 26,000 are single adults. As well, 32,830 children (under 18 years of age) live in low income families. That’s 18.4% of all children in Edmonton. Of this total, 14,470 lived in couple families and 18,376 lived in lone parent families. 56% of these children lived in single parent families, with the remainder (44%) living with two parent families. The poverty numbers are distressing in and of themselves, but I believe we need to open our eyes up wider to the economic vulnerability facing our citizens here in Edmonton, but also beyond. For example, the Payroll Association of Canada reports that approximately 44% of Canadians are living paycheque to paycheque and that even a one week delay in receiving their pay would create a crisis for their families. This percentage relates to people who are working, not to individuals and families who are dependent on social assistance (in its various forms) or on old age pensions. Approximately, 600,000 people are employed in Edmonton (CMA). If the Payroll Association’s data is correct, this means that 264,000 workers in our community are living paycheque to paycheque. I realize that there will be some overlap with the numbers of people living in poverty, but nevertheless, this is a huge number, much larger than those that live at or below the so-called “poverty-line.” I know. That’s hard to believe. Especially here in Edmonton, a city with a robust economy that is producing more jobs than any other jurisdiction in Canada. The last report I heard about was that our fair city in 2013 was responsible for creating 40% of the new jobs in Canada. Yep 40%! As mentioned earlier the income data for Edmontonians (and Albertans) suggests things are really working well for our workers. Fact is that 75% of workers are employed in low wage industries. A single person might “get by” on $17 to $19 per hour, but a single mother with a kid or two won’t. The housing and food costs locally have risen so dramatically over the last ten years, low income earners keep losing ground as their meager take home pay is eaten up by housing costs and meeting the most basic of needs. Various reports indicate that 25 to 30% of Alberta workers earn $15.00 or less per hour. In Edmonton, that would equate to approximately 150,000 to 180,000 workers. Sure we have a fairly low unemployment rate, but keep in mind, that rate only includes people “actively seeking work.” It does not fully include people who have been out of work for an extended period of time or people who “passively” seek employment through reviewing newspaper ads or online services. As well, people who have “given up” looking because of experiencing long periods of a lack of fit with the labour market are not included. 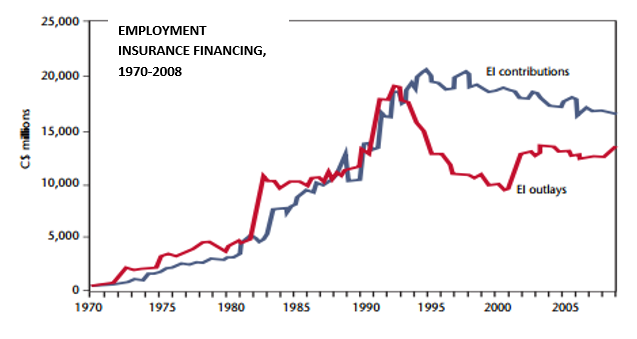 The Bank of Canada reports that 20% of those unemployed have been without work for 27 weeks or longer, and that the longer one is employed the harder it is to find work because of the bias employers have against those who have been out of work for a long time. Not only that – while the unemployment rate may currently be low for the majority, certain segments of the population experience unemployment rates that are often in the double digits, including the disabled, Aboriginal people, newcomers, and younger workers. Just looking at only one employment indicator as an economic measure paints an inaccurate picture of what the workforce is really facing. What’s even more troubling is that only 38% of unemployed Canadians actually receive EI benefits. Something seems wrong here, doesn’t it? The workers who need this insurance most are lower income workers who are paying the highest percentage of their income in EI premiums, contributing to the cumulative surplus in the EI fund and all for a bit better than a one in three chance of receiving benefits. You know that saying about a picture being worth a thousand words. It seems to ring true in this instance. Contained in the ESPC report I mentioned earlier, this chart suggests something is awry when it comes to how Edmontonians benefit from the economy. First, it indicates that we have the wealthy one percent experiencing a growth in median income (adjusted for inflation) of about 50% from 1982 to 2o11. Then we have the wealthier wealthy seeing growth of nearly 140%. Over that 29 year period one might suggest the average annual rate of growth in both cases is not really a stupendous rate. Perhaps, although the bottom 90% of income earners and especially the bottom 50% are basically earning the same or less than 29 years ago. For comparative purposes, the average price of an Edmonton home in 1982 and 2011 respectively were: $91,405 and $325,000 (Source: http://www.chrisdavies.ca/). Between 2000 and 2010, rents went up on average 75% or more, depending on number of bedrooms. The cost of food in the same time-frame increased by approximately 50%. Teen birth rate is 10 times higher for low income than high income teens. Nearly 60% of our homeless population suffers from mental illness. Life expectancy is tied to income. For example, a Globe and Mail report in 2012 indicates: “Only 51.2 per cent of Canadian men in the lowest income group (the bottom 10 per cent) can expect to live to age 75. By comparison, 74.6 per cent of high-income earners (the top 10 per cent) can expect to see 75.” That’s quite the gap. There are, I suggest, some queries we should be making about many of society’s structures, systems, and attitudes we appear to be collectively content with perpetuating. Maybe “complacent” is a better word, but perhaps society’s collective unawareness of the various trends and forces that are increasing the economic vulnerability of its citizens is at the core of that complacency. Here are a few of the queries we should be investigating. 1. How do we feel about the high rate of illiteracy? And yes, I mean the word, “feel.” Do we believe illiteracy is simply is the result of individual flaws or laziness? How does the fact that two of every five Albertans experiencing a lack of basic literacy skills impact not only their future, but the health and well-being of our economy? 2. Are we satisfied with the lack of mental health services in our province and city? Are we even aware of the extent of such inadequacy? I suggest strongly that there is a correlation with the high rate of mentally-ill homeless people and the substantive lack of supportive housing for those who have such illnesses. Here’s a small piece of data: At Bissell Centre, we estimate that 60% of the street involved people we see daily in our drop in centre or on the street by our 24/7 outreach team are mentally ill. However, the funding we receive from the Alberta Government for workers who are trained to support the mentally ill is just under $90,000 per year and has been flat for years. How come? 3. Do we think a growing divide between the 1% of those with wealth and the remaining 99% bodes well for our economy and the future well-being of our communities? 4. Are we prepared to authentically understand and then address societal biases against the poor and in particular visible minorities? Regarding the last point above, let’s dig into some of the incarceration data for Canada. It costs $110,000 per year to incarcerate a man and nearly double that for a woman. “The federal budget for the Correctional Service of Canada (CSC) has increased 40 per cent to $2.6 billion in the past five years.” This amount not only includes the incarceration costs of 15,000 federal inmates, but the funding of additional cells. By the way these expenditures are likely lower than they should be, given that the government has been reducing wages for prison staff, holding the line on health services and others designed to assist in rehabilitation. One in five inmates is over age 50. The average level of education is Grade 8. 80% of offenders have addiction or substance abuse problems. 80% of federally sentenced women have been sexually abused. 31% have Hepatitis C and 5% have HIV. Almost half of all offenders required mental health care in the past year. In the last decade, the incarceration of visible minorities has increased by 75%, while the incarceration of Caucasians has declined significantly. Despite being a small proportion of the population, Aboriginal people make up 25% of those in prison and the rate of incarceration of Aboriginal women has increased 80% in the last ten years. Although the CBC article does not address the correlation of poverty with incarceration, we do understand, don’t we, that the data above does not correlate with the profile of people in society who are able to earn a good living. Being wealthy is not unjust, but don’t we need to ask ourselves about what is just for people of low income, the mentally-ill, victims of sexual abuse, and the alarming rate of incarcerating visible minorities and Aboriginal people, all of whom tend to have a high incidence of low income? Civil unrest in the world is often tied to extreme divides between the wealthy few and the poverty of the majority, and we know that civil unrest has deleterious impacts on the overall economy, not to mention community health and well-being. No one wants that for our country of course. But are we paying due attention to the myriad factors that are contributing to an unjust society? Do we not think that there is an eventual tipping point when our lack of attention to income inequality will hurt everyone? While I want to stress again that my commentary is my own and should not be tied to any formal or informal position of the Mayor’s Task Force on Ending Poverty, I will say I am encouraged to see so many people from all walks of life and of all income levels, sitting at the same table with a visionary Mayor looking into how to end what I believe is the most serious problem facing us in Edmonton, in Alberta, our country, and frankly the world: poverty. 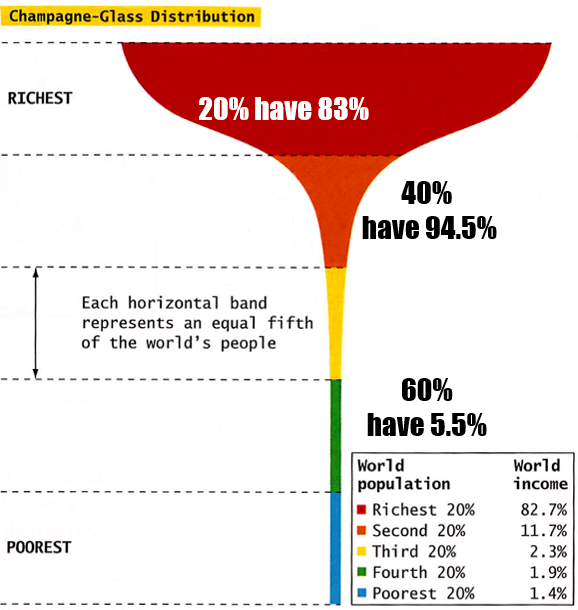 I will end this article with one more picture that needs no commentary, which shows the income divide world-wide. What do you think the implications are? Amazing job Mark. The other thing that strikes me is that we are bombarded with this group of elite, in the news, critiquing minimum wage increases and tax increases. We need to hear the real story (like this article) with some common sense approach for getting back in balance. Thanks for starting the conversation !!!! THERE’S MORE TO DO TO IMPROVE AISH, ISN’T THERE?